Apparatus: Antenna Trainer Kit, Half Wavelength Dipole antenna, Directional Coupler, coaxial connectors. A parabolic antenna is an antenna that uses a parabolic reflector, a curved surface with the cross-sectional shape of a parabola, to direct the radio waves. The most common form is shaped like a dish and is popularly called a dish antenna or parabolic dish. The main advantage of a parabolic antenna is that it has high directivity. It functions similarly to a searchlight or flashlight reflector to direct the radio waves in a narrow beam, or receive radio waves from one particular direction only. Parabolic antennas have some of the highest gains, that is they can produce the narrowest beam width, of any antenna type. In order to achieve narrow beamwidths, the parabolic reflector must be much larger than the wavelength of the radio waves used, so parabolic antennas are used in the high frequency part of the radio spectrum, at UHF and microwave (SHF) frequencies, at which the wavelengths are small enough that conveniently-sized reflectors can be used. Parabolic antennas are used as high-gain antennas for point-to-point communications, in applications such as microwave relay links that carry telephone and television signals between nearby cities, wireless WAN/LAN links for data communications, satellite communications and spacecraft communication antennas. They are also used in radio telescopes. 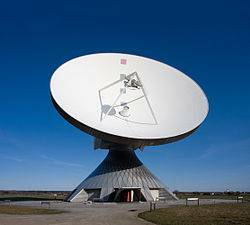 The other large use of parabolic antennas is for radar antennas, in which there is a need to transmit a narrow beam of radio waves to locate objects like ships, airplanes, and guided missiles. 1) Mount the Parabolic Reflector antenna on receiver stand of antenna trainer kit; connect a coaxial cable between antenna and input section of transreceiver meter. 2) Mount Half wavelength dipole antenna on stand of transmitter stand of antenna trainer kit, connect a coaxial cable between antenna and output section of transreceiver meter. 3) Apply a frequency of 1250 MHz (1.25 GHz) to transmitter antenna by varying knob on transreceiver meter. 4) Take the reading of field strength of receiver antenna, which indicated on transreceiver meter, note this reading as first reading for angle of 0 degree. 5) Rotate the receiver antenna mount with an increment of 5 degree and take respective readings. 6) Plot the 2D radiation pattern of antenna using observed readings. 8) Output terminal of directional coupler is connected to input terminal of transreceiver meter, and common terminal is connected to input terminal of transreceiver meter. 9) Press VSWR button on transreceiver meter you get value of Vi (incident Voltage). 10) Now reverse the direction of input & output of directional coupler and press VSWR button you get value of Vr (Reflected voltage) & VSWR. 5) Beam width can be calculated by observing 2D radiation pattern. Conclusion: The parabolic reflector antenna was analyzed on antenna trainer kit. Field Strength of various angle were obtained and radiation pattern were plotted for same: highly directional having maximum lobe in one direction. What are the different types of parabolic reflectors? Parabolic reflectors are generally used for which frequency range? List different feeds used for parabolic reflector. What is the advantage of cassegrain feed? What is the main advantage of parabolic reflector antenna? Draw the radiation pattern for parabolic reflector antenna?